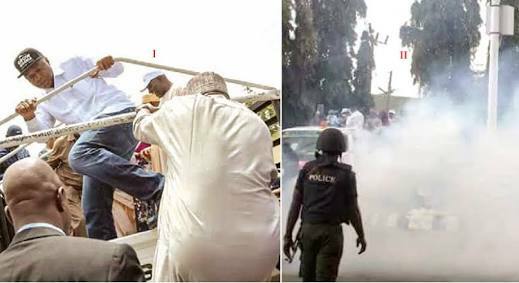 For having a peaceful protest that was allegedly attacked by policemen on Friday, Senate President Bukola Saraki, Senator Dino Melaye and Senator Ben Bruce have been summoned to report at the Louis Edet House police headquarters on Monday. This was contained in a statement issued on Friday night and titled “Dispersal Of Unruly And Violent Protesters Who Attacked Police Personnel On Duty In Front Of The Force Headquarters, Abuja." “They were thereby disturbing public peace and public safety and causing innocent people to scamper for safety and violent attack on Policemen posted to ensure security of the Force Headquarters, pushing and hitting the Policemen to forcefully enter the Force Headquarters to cause damage to Police equipment and Government properties,” the police alleged. The police further alleged that with the assistance of miscreants, the trio were “causing innocent people to scamper for safety”..
“The Police team headed by a very Senior Police Officer despite the provocation, after issuing words of proclamation, warning this unruly PDP protesters who were chanting war songs of ”we no go gree o , we no go gree , we no go gree ”, charged the Police personnel who used minimum force and dispersed them. “The Inspector General of Police has directed immediate investigation into this unprovoked and unwarranted attack on the personnel of the Nigeria Police Force and the Force Headquarters premises which is against the law and condemnable . 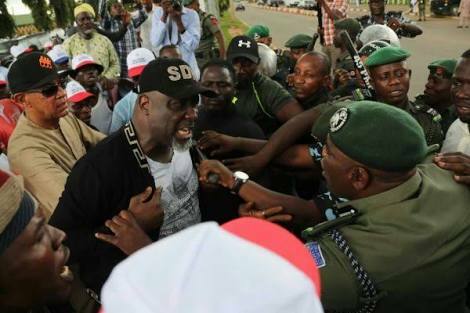 “Consequently, Senator Bukola Saraki, Senator Dino Melaye and Senator Ben Bruce who were captured on camera to have been involved in the disturbance of public peace and public safety… are hereby invited to report themselves to the IGP Monitoring Unit at the Force Headquarters on Monday, 8th October, 2018 for investigation,” the police stated.